Energy prices are at their highest at times of peak demand – hot summer afternoons or evenings as people get home from work. That’s when extra power plants are fired up to meet the spiking demand. But for most ratepayers, there is no financial incentive to avoid using energy at these times. In Illinois, the Citizens Utility Board (CUB) and the Environmental Defense Fund (EDF) are asking regulators to demand that utilities ComEd and Ameren Illinois institute “time of use” pricing to charge customers more accurately for the price of electricity at the time they use it. That means energy used at night or other low-demand times would be much cheaper, and energy used at peak times more expensive. People would theoretically then shift nonessential electricity uses like running the dishwasher or charging batteries to low-demand times, saving money on their bills and curbing energy demand, potentially cutting the need for extra carbon-emitting generation. In a filing with the Illinois Commerce Commission on Feb. 12, EDF and CUB asked the commission to order ComEd and Ameren to develop time-of-use plans and offer the option to their customers soon. The commission had previously ordered the utilities to study the possibility, but CUB and EDF indicated the utilities are not moving quickly or concretely enough to make time-of-use a reality. “We hope to be able to work with the utilities on this, we think it’s in the interest of consumers and the state,” said CUB executive director David Kolata. “We haven’t reached any agreement with them yet, but we’re hoping we can. CUB and EDF are members of RE-AMP, which publishes Midwest Energy News. Smart meters that both ComEd and Ameren are distributing allow people to see their energy use broken down by time of day. With those meters in place, time-of-use pricing would take little extra effort on the utilities’ part, the proponents say. One of the goals of the state Energy Infrastructure Modernization Act, or Smart Grid bill, was that “participating utilities should offer innovative technological offerings that will enhance customer experience and choice,” as the ICC filing says. While the law does not require time-of-use rates, EDF and CUB say it would be a good way to fulfill the spirit of the legislation. “We need to have smarter pricing options available for consumers in order to take full advantage of the smart grid infrastructure,” said Kolata. Ameren Illinois spokesperson Victoria Busch said she could not respond to specific questions regarding the ICC filing or the company’s time-of-use plans. But she said the utility is working on such programs as they roll out smart meters (or advanced meters) to customers. “We are in year four of a 10-year plan to invest $3.5 billion to modernize our energy delivery infrastructure. As part of that plan, we have just begun to install an advanced metering system. 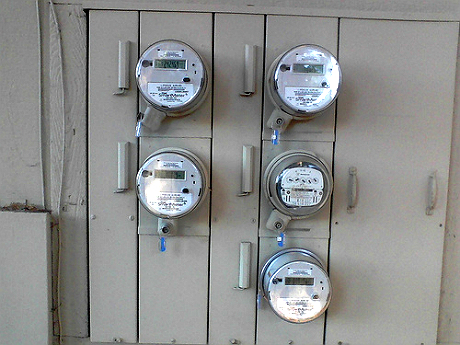 By 2019, approximately two-thirds of our customers will have an advanced meter. O’Dowd said ComEd sees time-of-use as potentially part of their smart grid efforts. In their ICC filing, CUB and EDF propose a structure where the day is divided into three blocks for peak, off-peak and super off-peak demand. The blocks would be four, 12 and 8 hours, respectively. Prices for each block could be set annually or every two years based on average demand and cost at those times of day. So ratepayers would know how much they would be charged for using electricity during a given block. CUB describes time-of-use as a middle ground between real-time pricing and traditional flat rates. “Even though market prices plunge to just a few pennies per kilowatt-hour or lower at certain hours of the day—most Illinois residents cannot take advantage of these low prices because they are locked into rigid, ‘flat’ rates that only change with the season (e.g., summer, non-summer),” wrote EDF senior economist James Fine in a recent blog post. Alternative retail electricity suppliers could also offer their customers time-of-use pricing, and at least one Illinois supplier does, Kolata said. But since alternative suppliers have fewer customers and fewer resources to put toward customer education, enlisting the utilities is the priority. The filing notes that previously utilities and the commerce commission had raised concerns about whether time-of-use programs would violate the Integrated Distribution Company (IDC) rule barring utilities from offering services that compete directly with alternative suppliers. Time-of-use pricing would not be a “service” in that sense, and utilities can also request a waiver from the rule, so that rule is not a reason to stall on offering it to customers, Kolata said. The ICC filing proposes that a time-of-use rate be offered as an opt-in program for four years, meaning customers would volunteer to participate. Then starting in the fifth year it might be an opt-out program, where customers are automatically enrolled unless they decline to participate. The filing asks that once a final order is made, the utilities be mandated to file a rate proposal including time-of-use pricing within 90 days. There is no deadline by when the commission must take action on the filing, but Kolata said he is hopeful of seeing progress on the issue within the year. Time-of-use could be especially beneficial for customers in ComEd’s territory in northern Illinois, which is part of the PJM regional energy market. That’s because rate hikes for customers are likely looming thanks to changes in the works in how power companies in the PJM are paid for promising to have the capacity to generate extra electricity. Ameren’s territory in downstate Illinois is in the MISO energy market, which doesn’t have the same changes on deck. Capacity costs can be contained if peak demand times are reduced. Kolata said utilities would not lose money even if a consumer reduces their energy use, because in the deregulated energy market in Illinois the utilities are paid to deliver electricity, and separate power companies are the ones who sell the actual energy. Time-of-use pricing is still “pretty rare” nationwide, though there are a handful of pilot programs in place, Kolata said. Fine has reported on high interest in time-of-use pricing in California, where Sacramento ratepayers are all scheduled to be enrolled by 2018.